Organ meats and glands were a staple of our early ancestors' diets as the ultimate superfood, for good reason. It turns out, this nourishing tradition is backed by science... "Radioisotope labeling studies in animals have shown conclusively that, when eaten, organs and glands selectively travel to the corresponding organs and glands in high concentrations. This research, done at the University of Scotland in Edinburgh, lends credence to the ancient practice of eating animal organs to help ensure health in one’s corresponding organs..." - Dr. Ron Schmid, ND. * Our early ancestors knew this, which is why their traditional diets included the frequent and nourishing consumption of nose-to-tail organ meats and glands. Perhaps we could learn something from the most ketogenic culture of all time when it comes to thyroid health and its influence on one of the most important markers of health status… fertility!! It could well have been that consumption of moose thyroid was an important means of maintaining fertility in the face of the level of carbohydrate restriction that the Arctic environment forced on its inhabitants. I personally love ketosis… I especially go deeper into ketosis during the Winter months in an effort to model ancestral living. 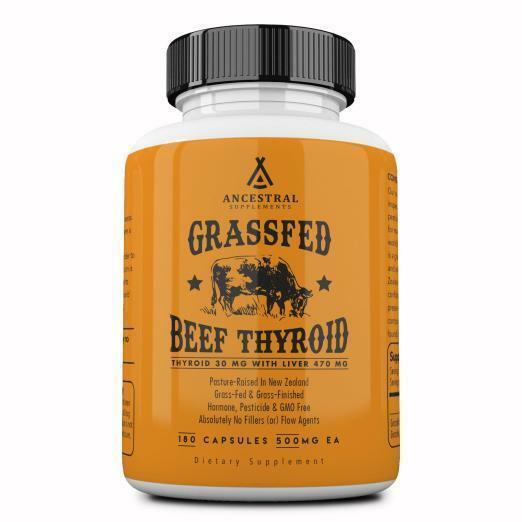 That said, I also like to consume grass fed thyroid during this time… I, as well as others that I know that do the same, feel and function and perform much better with a little thyroid on board. We’ve all done plenty of testing with FREE T3 to support this ancient ancestral practice. Functional ranges of FREE T3 are 3.0 – 4.0 pg/mL. If you’re below 3.0 pg/mL, you might be hypothyroid. Would ketosis hurt ya or help ya… Completely depends on why you’re hypothyroid… for instance, if you’re hypothyroid because of stress / cortisol dysfunction, then chances are your reverse T3 (rT3) has been upregulated thus displacing free T3 (at the cellular level) in an effort to slow you down and get you recovered. Same thing happens when you get sick, or get the flu but with chronic stress, it’s never ending which is why hypothyroid is common here. Going low carb / keto could be disastrous because keto is yet another low-grade chronic stress.... Not sleeping well is a low grade stress... Not eating well is a low grade stress... Food sensitives (especially gluten, msgs, artificial food-like products) are a low grade stress... Moving too much (or) not moving enough is a low grade stress... Danger / poison is a stress (think lions, trans fats, sugars, fluoride, excessive wifi, emfs, vaccines, mercury, non-native water, plastics, non-native clothing, non-native bedding, non-native eating and drinking containers, flame retardants, etc)... you get the picture. On the other hand, if you’re vitamin A and/or D deficient (like most people), this can prevent T3 from activating your cell. Or, if you have a selenium or iodine deficiency, conversion of T4 to T3 (active thyroid hormone) issues can arise. In these cases, going keto is probably not going to hurt but it’s obviously more important to fill the nutrition gaps to support one’s thyroid. Here’s the question… Why are your reverse T3 numbers high? Do you know your FREE T3 numbers? Cortisol is important too but you’d need a 24 hour saliva test to know what’s going on here. In summary, keto is not categorically bad for people with hypothyroid issues… but it could be… it just depends. Kresser, Chris, and Amy Nett, MD. "RHR: Subclinical Hypothyroidism-What You Need to Know." Chris Kresser. N.p., 14 Oct. 2015. Web. 24 June 2017. "General Information/Press Room." American Thyroid Association. N.p., n.d. Web. 24 June 2017. Osborne, Peter, MD. "10 Nutrient Deficiencies Every Thyroid Patient Should Have Checked." Hypothyroid Mom. N.p., 12 June 2015. Web. 24 June 2017. Edwards, Michael. "Understand Hypothyroidism – Prevention and Natural Remedies." VICTORY OVER CANCER. N.p., 11 Nov. 2015. Web. 24 June 2017. "Natural Thyroid 101." Stop The Thyroid Madness. N.p., n.d. Web. 24 June 2017. Patrick, Rhonda, Ph.D. "New 20-page report on cryotherapy just released! Cold shock boosts catecholamines up to 5-fold & increase type of immune cell that kills tumor cells." FoundMyFitness. N.p., n.d. Web. 17 June 2017.